Facebook Live is a video streaming service launched by Facebook in 2016. 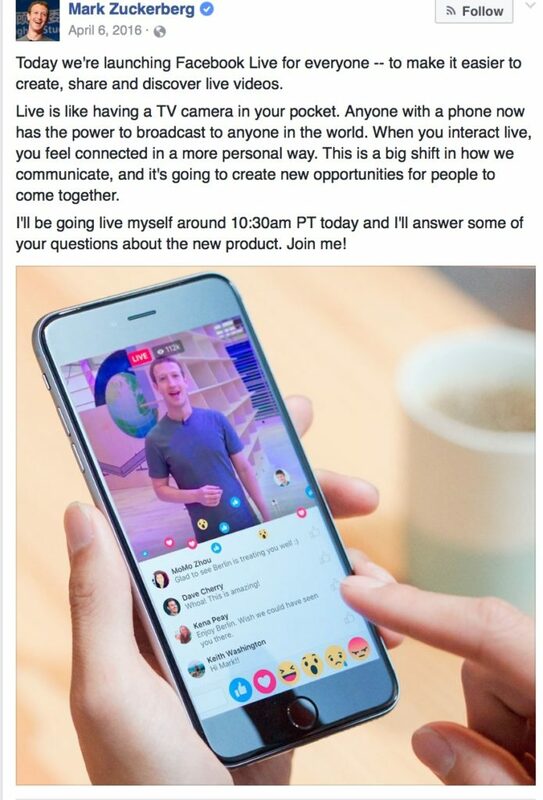 CEO Mark Zuckerberg launched Facebook Live with a broadcast on the 6th of April 2016. The unique form of video content allows for raw and authentic broadcasting through the Facebook social platform or mobile app. By tapping the stream icon, brands broadcast compelling videos, giving followers a chance to “tune in” to live content. Facebook Live allows for two-way conversations between companies and clients with commenting and emoji reactions in real-time. Notifications: As a distinct content type on Facebook, Live has its own notification system. Live video notifications are set to “on” by default on follower accounts. Filters and masks: Add personality to your live stream with filters and “masks.” These extras add fun colors and animations to your video. Maps: Facebook Live Map helps users find new and exciting content. The live chart provides a way for people to find local videos with ease. Invite friends: Users watching broadcasts send invitations to friends that invite them to join in with the stream. Encourage requests on your videos to boost your brand reach. Live Reactions: Like with any Facebook post, there’s an option to react to Live content using 6 emoji reactions. Facebook Live permits the use of reactions in real-time. This helps brands to gauge customer reactions to certain points in their content. Since Facebook Live’s launch, live streaming has grown astronomically in popularity. 16% of marketers began broadcasting in 2016 alone. As of 2018, nearly 2 billion people have tuned into Facebook Live broadcasts. A better way to connect with their audience: Real authentic videos demonstrate brand personality and prompt business growth. Unique features for audience engagement: Real-time commenting and live reactions allow for deeper conversations with customers. Cost-effective content: Live videos are raw and organic. There’s no need for expensive editing and production. Built-in analytics capabilities: Track your performance with Facebook analytics. View real-time reactions to your content or enhance your insights with a tool like Sprout Social. Improved reach: Keyword-rich descriptions, hashtags, and location tagging improve brand reach. Go to your news feed and choose the “Live” option. It’s a small camcorder icon. Allow Facebook to access your microphone and camera. Choose the privacy settings you feel comfortable with and who you’re going to broadcast to. Write an enticing description for your stream. Tag crucial people, including employee advocates. Set up your camera view and add lenses, filters or drawing to your video. Interact with viewers by asking for comments and live reactions. Click “Finish” to complete your broadcast.